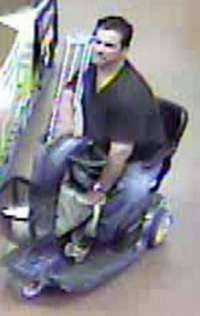 Arizona cops are seeking the public’s help in identifying a thief who fled Walmart on a mobility scooter after pinning a worker to the wall during his escape. As seen in the above store surveillance video, the suspect was confronted earlier this month by a female Walmart employee near the Tucson store’s exit as he sought to leave with unpaid items in his scooter’s front basket. After some evasive driving, the suspect ran into the Walmart worker, driving her backwards into a large blue bin. As two men came to aid the woman, the suspect drove out of the store on his gray ride. According to police, the suspect, who is around 50, is a white male with brown hair and a mustache. The man, who was carrying crutches and wore a red University of Arizona baseball cap, is a suspect in a prior theft at the same Walmart.